Bistecca - An Italian Steakhouse - New American cuisine with an Italian touch! Enjoy a world class meal in our elegant surroundings, right in the heart of Highland Village. Join us for dinner or cocktails, and discover why Bistecca repeatedly wins top awards! 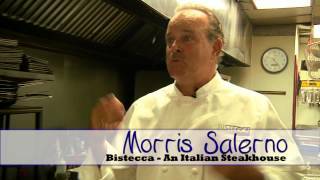 See Executive Chef Morris Salerno in action in the kitchen at Bistecca as he describes the inspiration for recent menu changes. Discover fine dining in the heart of Highland Village. Award-winning chef Morris Salerno draws from his rich family heritage to serve up new American cuisine with an Italian touch. Savor scrumptious pastas, fresh seafood, lamb, veal, osso bucco, and of course a full range of high-quality steaks. One of the most romantic restaurants in Denton County, Bistecca - An Italian Steakhouse is perfect for an evening of great food and conversation with friends and loved ones, or to celebrate a special occasion. Enjoy a flight of wine, soak in the elegant atmosphere, and savor the menu at Bistecca - An Italian Steakhouse! MAKES A PERFECT GIFT: Order Chef Salerno's New Cookbook Today! You've seen him on Hungry Investors, now get the secrets to Executive Chef Morris Salerno's success when you pick up his latest cookbook, More Morris' Way. Order today for only $25. 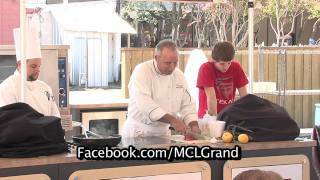 You can even request to have the cookbook inscribed with a message from Chef Salerno! Add a copy of Chef's timeless culinary classic, Morris' Way, for only $5 more! Click here for details! Learn about Executive Chef Morris Salerno's culinary background and the inspiration for his exceptional menu. UNT students studying for a career in the hospitality industry had the opportunity to work alongside guest chef Morris Salerno. Voted Best Steakhouse and Best Fine Dining in Denton County for 2015!